A quick stroll through the Japanese Market equipped me to make today’s drink, in which I made use of mangosteen, and also Choya Umeshu, which is a Japanese plum wine. Mangosteen is not as sweet as lychee, and it has a softer texture, but it’s close enough that I intuitively used a similar process to this muddled lychee and gin drink, except I omitted the lemon juice, for it was not necessary. Mangosteen is very expensive, and its flavor is not distinctive. It is light and watery, with a hint of a tropical fruit flavor, like like tart berries with a touch of pear. For this reason, I do not recommend using it to make drinks, but I didn’t know that, and neither would you if no one told you, no? If you’re like me, you’re constantly looking for novel flavors in your food and drinks, so maybe you think, sure, I’ll splurge on some tropical fruit, even though I have no idea how to pick a ripe one or if it’s even reasonable to expect to get good quality mangosteens this time of year. Maybe if you eat them closer to their point of origin, they have a stronger flavor. No matter! I made a drink out of them anyway, and it was quite a good drink in spite of the mildness of the muddled fruit. Umeshu is made by infusing macerated japanese plums, called ume in shochu, and sweetening it with sugar. I noticed that the neighborhood Japanese market was selling 750 ml bottles of this as a liqueur (subject to the WA state hard liquor taxes) and also as a wine, so I, of course, opted to purchase the latter. I’m not sure if Choya is the good stuff; in fact I’m pretty sure it’s the cheap stuff, but it tasted pleasantly of plums, so I used it exactly like a fortified wine. Bonus: it came in 50ml glass bottles, perfect for making exactly two drinks. A fortified wine you can keep in the pantry? Someone needs to put the fine folks at Choya in touch with whoever makes Carpano Antica. Muddle the mangosteen in the turbinado syrup, then shake all ingredients over ice. 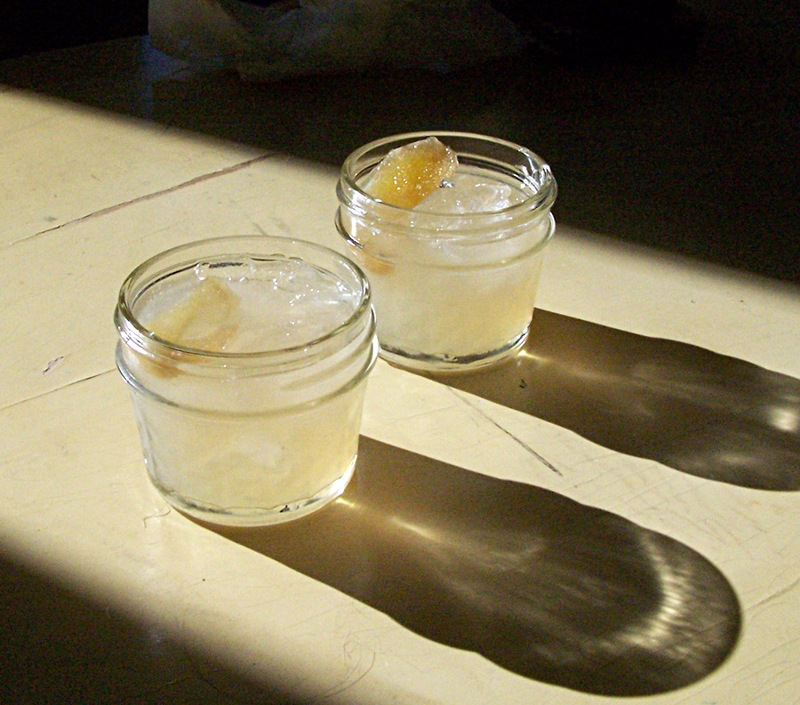 Double strain over fresh ice and garnish with a piece of candied ginger. This drink was excellent, in spite of the mangosteen having a light flavor. The extra sugar from the syrup helped to bring out its fruity flavors and the umeshu bridged the gap between astringent gin and sweet fruit. Making the drink was easy, but naming it… that I am not so good at. If anyone has a better idea of what to call this, please let me know. Personally, I don’t think every delicious thing you throw in a mixing vessel needs a name. If observe good practices regarding drink construction, and you mix according to your good taste, then you have done enough. The best drink names are clever puns. Categories: modern drinks, original creations | Tags: alcohol, bartending, booze, choya, cocktail, cocktails, drinking, drinks, gin, hayman's, mangosteen, mixed drinks, mixology, muddle, muddled, old tom gin, plum wine, simple syrup, sugar, turbinado, ume, umeshu | Permalink.